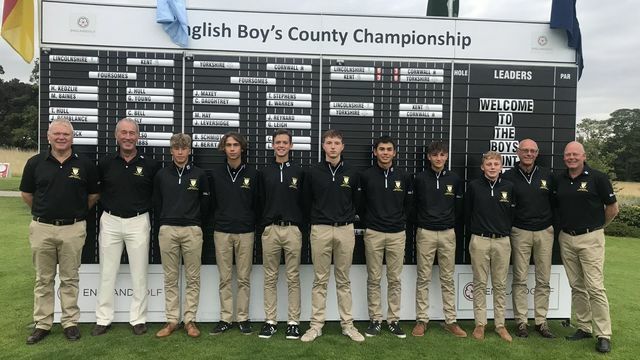 The Cornwall Boys U18s team - which includes four 15 year olds - have been doing battle in the North East of the country over the past two days at the English Boys County Finals and today play their final match against Kent. The Duchy boys are today looking for a morale boosting win after two days of fierce competition where the team without gaining a victory have fought doggedly, behaved impeccably and been able to hold their heads high. Under team Manager Gary Andrew and assistant Derek Law and accompanied by CGU President Mike Ellis and Juniors President Alan Lund the team have represented Cornwall with great pride and can consider their performances to date worthy of greater success. On the magnificent Rockliffe Hall course in Durham day 1 saw the Duchy face Lincolnshire. Leading out for Cornwall in the first of the three morning foursomes Cameron Gurd and George Law lost the first three holes and never recovered going down to Hugo Kedzlie and Michael Baines 5&4. Arguably the strongest Cornish pairing of George Leigh and County Junior Captain Joe Reynard gained a half in their match with Olly Mitchell & Thomas Hull before Liam Wilson and Thomas Stephens did the same in their game with Jake Craddock and Callum Bruce. In both cases Cornwall had gone to the 18 tee 1 up but both times their Lincolnshire opponents made birdies to gain the halves. The six afternoon singles saw a resounding 8&6 win for Leigh over Craddock and a further win for Reynard who after being 1 down through 6 holes turned his match around and won 4&2 over Mitchell. Law was well beaten (5&4) by Baines and the same margin resulted in a defeat for Gurd at the hands of Hull. Ewan Warren was beaten 2&1 by Bruce but had fought valiantly having been 3 down through 12 holes. Another fighting performance came from Liam Wilson who was involved in a tight match with Lincolnshire’s very experienced Hugo Kedzlie. The terrier Wilson fought very hard before succumbing 2&1. Going out first Thomas Stephens and Ewan Warren were 2 down through 3 holes but by the 6th had reduced the deficit to just one and with great spirit they maintained this before losing at the last by that margin to Jack Maxey and Charlie Daughtrey. George Leigh and Joe Reynard had already delivered a 3&2 win over Michael Hay and Jack Leversidge and so to Cameron Gurd and Liam Wilson. The pair were 3 down to Ben Schmidt and Joshua Berry through 9 holes. Schmidt was runner-up in this year’s McGregor Trophy and went on to win the Lee Westwood Trophy at his home club, Rotherham, whilst his team-mate Berry is the French U14 champion. Gurd and Wilson never gave up though and battled their way back into the match. When Gurd holed for birdie on the last the pair had gained a very well deserved half against strong opponents. The afternoon singles perhaps predictably saw Yorkshire flex their muscles as they claimed 5 of them. Cornwall’s winner was Gurd who beat Daughtrey 6&4. Leigh went down 3&2 to Maxey, Reynard despite being under par went down 6&5 to Schmidt, George Law lost 5&4 to Hay, Wilson, 3 down through 9 holes to Leversidge again fought hard before eventually losing 1 down and Warren lost 4&3 to Callum Macfie. In the day’s other game Lincolnshire tied with Kent at 4.5 points each. This means Yorkshire top the table from Lincolnshire and the two will face each other today on Day 3 whilst Cornwall play Kent.